Edmonton Springs Golf Resort has created a Championship Level Golf Course just 5 minutes west of Edmonton on Highway 16 (Yellowhead Highway). Edmonton Springs Golf Resort’s goal is to provide our players with a first class golf facility at a reasonable cost. 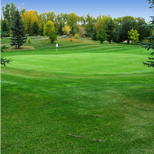 We have the most challenging Championship level Golf Course in the Edmonton Area. Our yardages are from 5800 yards to 7300 yards. We will be adding more tee boxes to further enhance every player’s enjoyment, from the novice to the most skilled players. The course features a plethora of challenging and scenic holes that will make your golf experience a memorable one. Some of the holes highlights include a challenging 16th hole that features an island green. There are beautiful lakes around our 16th and 18th hole. Come play the most exiting golf course in Edmonton!